The first page of my latest print article in Physics World. Unfortunately, there doesn’t seem to be an online version. The dancers are an elegant pair. Clothed in the fabric of space–time, they are driven by the music of gravity and make a stately orbit around one another once every two-and-a-half hours. They pirouette as they move – one spins once every few seconds while the other spins many times per second – and each one of their twirls is marked by an intense flash of light. The dancing partners are pulsars – spinning neutron stars that send a regular blip of light our way. Named PSR J0737-3039, this duo is one of a kind. More commonly known as the “double-pulsar system”, it is the only two-pulsar system where we have observed both partners. Other binary-pulsar systems exist, consisting of a pulsar and, for example, a white dwarf or a (non-radiative) neutron star. However, astronomers find the double-pulsar system particularly valuable because it consists of two flashing beacons rather than one, and the more information they can glean to test their theories, the better. Unfortunately, this article is currently only available in print, and Physics World isn’t a typical newsstand offering. Update: the editors have kindly let me repost the article here in PDF format for free download! You can also access all the content online by joining IoP (US$25 per year) and see everything they publish either through the Physics World website (which also has tons of free content) or the app, available on iTunes or Google Play. I am overly proud of the headline, and the concepts I described in the article are very interesting. In brief, measurable properties of neutron star exteriors are independent of the particular physics going on inside. Since neutron stars are some of the most complex objects we know of — they are the density of an atomic nucleus, the mass of a star, and the size of a city on Earth — anything we can learn to help study them is a good thing. A few theorists figured out how to relate observable properties to each other, in particular three parameters labeled I, Q, and the “Love number” (named for a person, not the emotion). 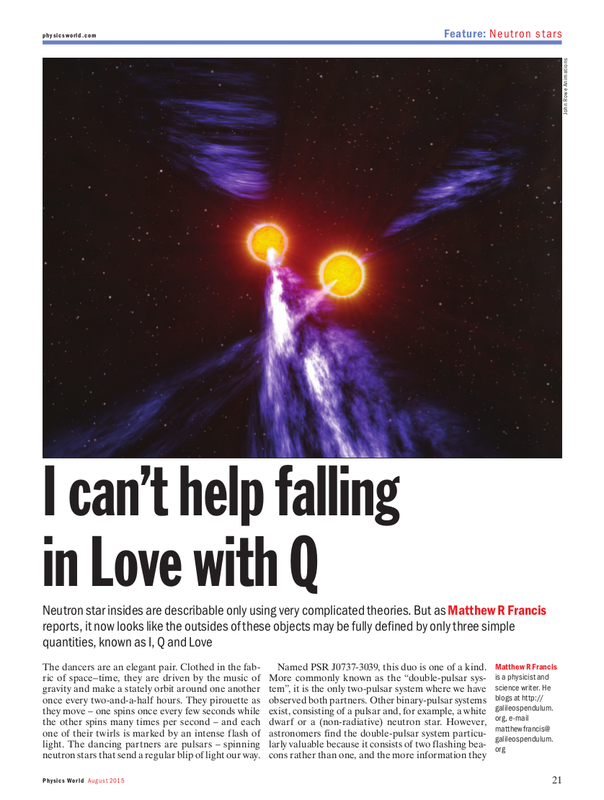 The I-Love-Q relations in combination with sophisticated neutron star observations could hopefully help us solve the deep mystery of what’s going inside an object that’s like nothing we can create in the lab.